Boats glide alongside actual swans on Lake Eola, at the heart of Lake Eola Park. The site isn’t big by many standards – a mile around – but it packs a big punch as an oasis in the middle of bustling, crowded Orlando. Locals and visitors flock here – like the geese they feed out of hand – to take in a little nature. The Orlando skyline rises in the distance, a stunning contrast to the peace and quiet of the park and a beautiful reminder of the nearby city. There are countless things to do in Lake Eola Park, including a weekly farmers’ market to visit, complete with fresh produce and live entertainment. Children run amok on the Lake Eola playground, and the iconic swan boats are a favorite for all ages. The park also has its own performance space, the Walt Disney Amphitheatre, which hosts events throughout the year. There’s even a restaurant on the premises; the Relax Grill promises to live up to its name. 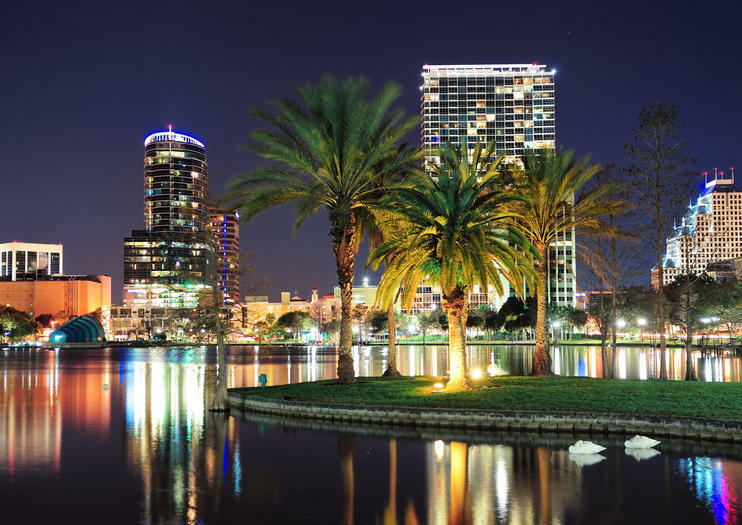 Lake Eola Park is located in downtown Orlando. There is no entrance fee, while the swan boats cost $15 for a half-hour rental. If you plan to drive to Lake Eola Park, make sure to bring change to pay for the street parking meters.